If there’s a really an identifiable punk/garage “ethic”, the Coathangers do it right. The band plays their instruments with abandon, writes songs that tell it straight, and at their wild live shows, they don’t hold anything back or pull any punches. 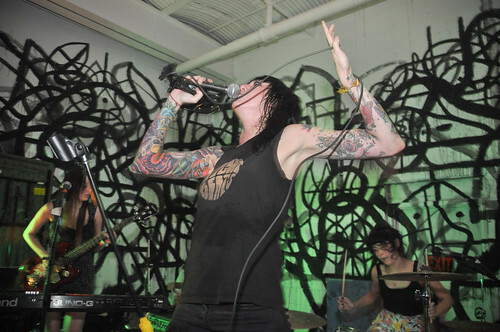 At their most recent NYC show a couple of weeks back at DIY venue 285 Kent, the Coathangers played a beyond-punk-length set that was extraordinarily entertaining for all the right reasons. Their energy, sense of humor, and apparent disregard for convention was evident from the outset — “Johnny” is a screaming punk song that set the tone that continued throughout songs like “Gettin Mad and Pumpin Iron”, “Nestle in My Boobies” and early 7″ release “Shake Shake” (streaming below). In between, the band performed much of their brand new release Larceny & Old Lace (Suicide Squeeze). As they were faced with an opening set deadline, the band continued to play through house music and ultimately when the microphone power was cut, performed the last song completely off-mic. It didn’t seem to matter though, as the massive crowd participation propelled the Coathangers to the finish. I recorded this set with the Neumann microphones on an eight-foot stand next to the soundboard and mixed it with a vocal-heavy soundboard feed. This room presents many audio challenges and the mix and balance of this recording was a difficult prospect. We’ve done the best under the circumstances, and hope you enjoy! 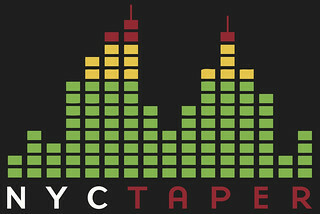 If you email nyctaper for access to this recording, we expect that you will PLEASE SUPPORT The Coathangers, visit their website, follow them on Facebook, and purchase their official releases at the Suicide Squeeze Records website [HERE]. and this group needs to study a bit.